EDINBURGH, SCOTLAND - Three newly-graduated American students have been commended for the highest quality of their work by the prestigious Chippendale International School of Furniture, with one student’s work being exhibited at the Scottish parliament. The School, near Edinburgh in Scotland, has built an international reputation in a niche area of further education, nurturing craftsmanship and raising the profile of furniture design and making as a career option – for students of all ages. Isaac Thompson from Orange County, California, a sculpture graduate, created a classic steamer trunk with a modern twist. Echoing the romantic days of long-distance rail and ocean travel, his oak Backgammon Trunk, veneered in sycamore, rosewood and mahogany not only provides space for essentials like clothing – but doubles up as a backgammon board, complete with checkers. The second student, Maureen (Mo) O’Brien also created a beautiful piece of furniture, with an equally practical purpose. Mo, from Camano Island, north of Seattle, made a Pet Owner Station that perfectly hides away all the clutter that a pet needs – from feeding bowls and food storage, to boots and outdoor clothing for the pet owner -all with a nice place to sit while gearing up. Mo, who worked in data communications for 25 years only recently moved to Camano Island from Texas. 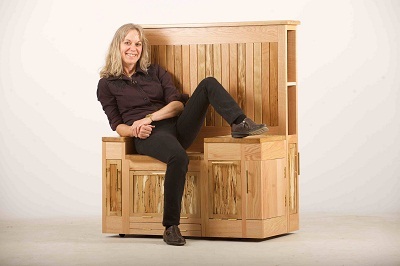 A dog lover, her pet station, made from beech, aromatic cedar, spalted beech and oak is not simply functional, but a very attractive piece of furniture. Each year, the Chippendale School attracts students from around the world for intensive 30-week courses, although it also runs a number of one-week “taster” courses. This year’s intake included students from Canada, the USA, Norway, Italy and the UK. 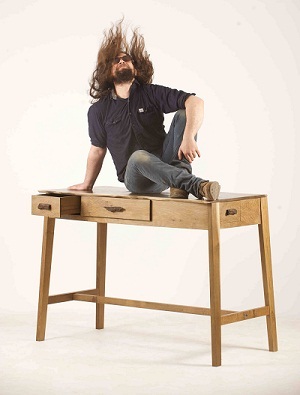 The third student, Dan Wallace from Boston, produced a signature Beasley Desk made from solid oak, with a recessed drawer on its top, and several drawers around the sides. 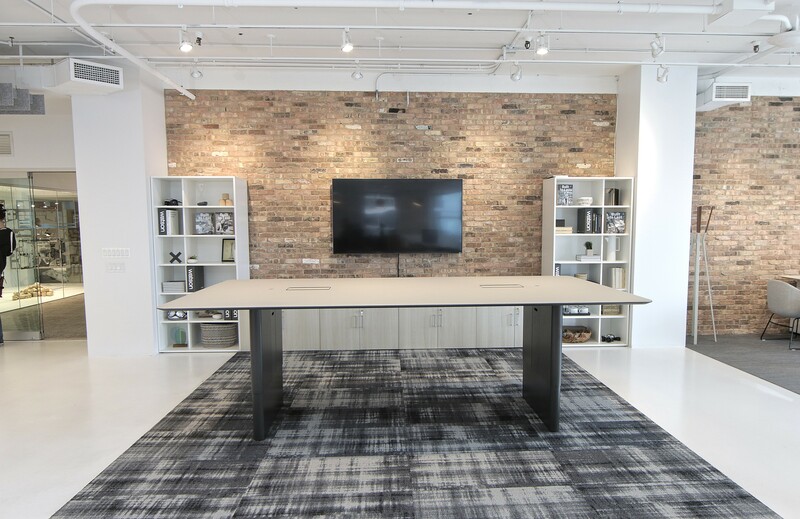 With a beautifully flowing design, it’s also higher than a normal desk – ideal for a designer or architect to stand behind. It’s a stunning piece of design and craftsmanship which manages to be both functional and a work of art. 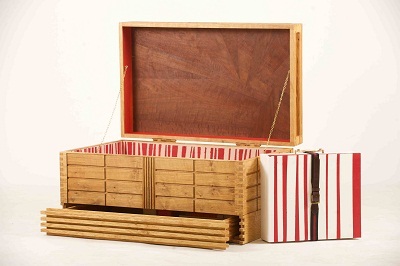 All three pieces were highly commended by Professor Demarco, who finally chose Isaac’s Backgammon Trunk to represent the School at the country’s parliament in Edinburgh. Anselm Fraser, the School’s principal, said that “all three students have demonstrated incredible talent, with all the pieces they have made through the year combining absolute quality and function with a very high level of aesthetic appeal. “Designing and making bespoke furniture should be about unlocking imagination to create the unique and Dan, Isaac and Mo have absolutely achieved that,” he said.